Wash the prawns, apply salt and keep aside for an hour in the ‘fridge. Meanwhile heat 1/2 cup oil in a dekchi (wok), add the curry leaves. Once they splutter, add the minced mixture. Stir fry for about 5 minutes, till a pale golden brown. Next add the ground mixture, chilli powder and salt. Stir fry till the raw smell dissipates and the color of the mixture is a deep golden brown. Take it off the heat. Fry the prawns in batches for around 1 minute each. Drain on a paper towel. Place the dekchi with the masala back on the fire. Add 1/2 cup of vinegar. Let it come to a boil. Boil vigorously for 1 to 2 miutes. Add the fried prawns, simmer for around 1 minute. Serve with rice, dal and some vegetables. 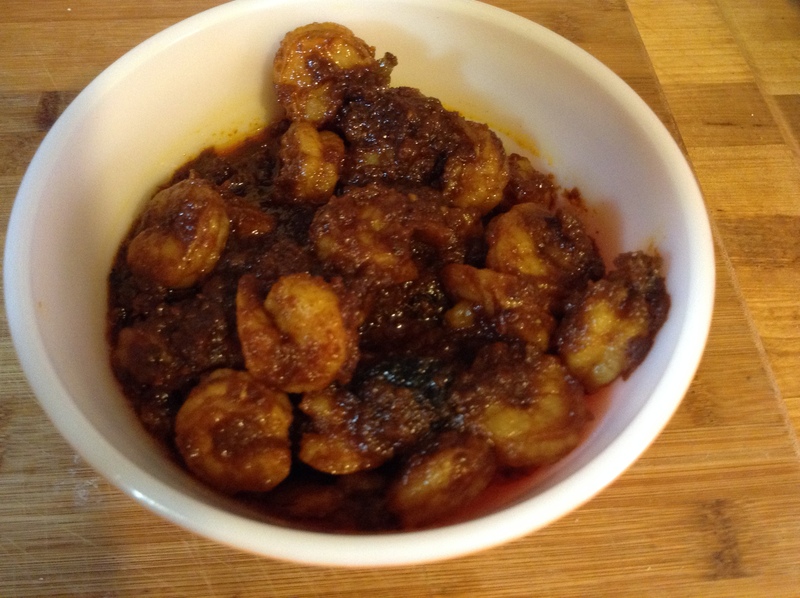 This entry was posted in Chilli Powder, Cumin, Curry leaves, Garlic, Ginger, onions, Prawns, Turmeric, Vegetable oil and tagged chilli powder, cloves of garlic, cumin, curry leaves, garlic, ginger, Prawn Balachau, Prawns, tamarind paste, vinegar. Bookmark the permalink.